Who are the best players for Saturday’s two-game DFS slate in Week 15 of the 2018 NFL season? This piece will highlight some of the best players and strategies for this short, special slate on both FanDuel and DraftKings. We will go position-by-position for every relevant player on this two-game slate. Deshaun Watson is the top quarterback play of the slate with the highest ceiling. He has at least 30 rushing yards in three straight games. Sam Darnold is our projected top value of the slate given his extremely cheap price tag. He’s in play given that he opens up a lot of other options for the rest of your lineup. Baker Mayfield has our fewest projected points despite being the second-priciest option on the slate. It’s a tough matchup in Denver. Case Keenum also opens up a lot of salary, although it’s only an average matchup against the Browns, who are directly in the middle of the league in terms of fantasy points allowed to quarterbacks. Phillip Lindsay is the top overall running back on the slate against the Browns, who have allowed the seventh-most fantasy points per game to running backs. 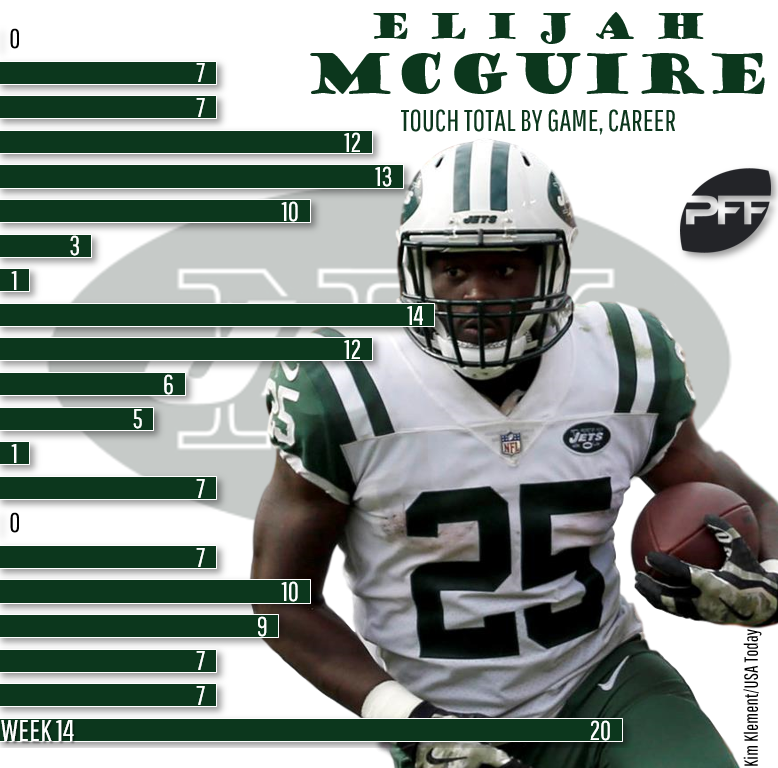 Elijah McGuire will remain as New York’s primary running back, and considering he’s coming off a 20-touch performance, he’s in play thanks to his cheap price tag even though it’s a bad matchup against the Texans. Nick Chubb has at least 16 DraftKings points in five straight games and at least three receptions in four straight. His touches have been down the last two weeks (less than 15 per game), but his big-play ability keeps him in play on a short slate. Lamar Miller has a smooth game log with at least 13.8 DraftKings points in six of his last seven games. He’s not a must-play with several other viable running backs on the slate, but he’s certainly not a bad option, either. Trenton Cannon scored last week, but he’s a desperation play even on the short slate. Royce Freeman adds no value through the air and hasn’t topped 50 yards since Week 4. Duke Johnson is the best bet among the super-cheap options, but his floor is dangerously low. DeAndre Hopkins is the top overall play on the slate and will likely be the highest-owned player. He has double-digit targets in two straight games — back to where he was Weeks 1-5. Demaryius Thomas has at least five targets in three straight games, making him a relatively safe play given his cheap price tag. Jarvis Landry has come through in back-to-back weeks — and he has no threat of Chris Harris Jr. covering him — but I still think he’s overpriced on this short slate given the plethora of viable cheap wideout options. Antonio Callaway has big-play potential, keeping him in play in large-field GPPs. His upside is improved thanks to Denver’s injury-riddled secondary. Courtland Sutton is a fantastic bounceback option this week after burning everyone as main-slate chalk in Week 14. Teammates DaeSean Hamilton and Tim Patrick shined last week, but heavy odds are that Sutton will be the primary wideout in Week 15 (and beyond). Let’s not forget Sutton was heavily targeted in the end-zone even with Emmanuel Sanders healthy. His 12 end-zone targets are tied for seventh most in the entire NFL. DaeSean Hamilton will likely be the highest-owned Denver wideout on the slate, but he does have the toughest individual WR/CB matchup among Broncos receivers. Tim Patrick saw double-digit targets last week and is a viable cheap wideout option, although he’ll probably be higher-owned than he should as people chase his high target totals. Robby Anderson obviously has the highest ceiling among Jets receivers, and his targets have improved over the last five weeks, with at least seven targets in four of his last five games. He’s a good salary-saver with Quincy Enunwa out. David Njoku has the highest ceiling among this slate’s tight ends and one of our two best values. The Broncos have given up the sixth-most fantasy points to tight ends this season, including last week’s 210-yard outburst by George Kittle. Chris Herndon is the other one of the two best values at tight end on the slate. The Texans have given up the ninth-most fantasy points to tight ends this year, including four touchdowns allowed to the position over their last five games. Matt LaCosse is a super low-floor play with a good matchup against the Browns, who have allowed the fifth-most points to tight ends. However, even as Denver’s lead tight end, he has just two total targets over the last two weeks. Jordan Thomas is the best play among Houston’s trio of tight ends with the most touchdown upside. He’s a GPP-only play.